Well, all good things must come to an end, huh? We finished the drive home today. Got up early, left the hotel by 8, and were home by 12:30 thanks to a FABULOUS nap taken by the sweet girl, who was exhausted. 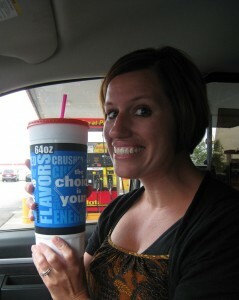 We drove straight through, ignoring the fact that I chose a bad morning for a gas station 44 oz. Anyway, that was probably too much information. Today was a very anti-climatic end to the trip, but that’s ok. Maelie didn’t miss a beat, going straight from the car to her slide. We did “celebrate” coming home by going grocery shopping as a family.I’m not sure that’s a celebration, but none of us had a meltdown, though one came close. It’s good to be home…and I’m so completely looking forward to sleeping in my own bed tonight. We left Mississippi today around 1:30 p.m. It was a great trip, and we’re thankful for the time we could spend catching up with friends. Like I’ve said many times before, often on our trips half of the adventure is getting there…or going home, in our case today. The adventures just kept coming. First up? I have always wanted to try one of these out…they obviously entered Americ a when I was out of the country, and today there was one IN a clean bathroom, WITH working straps. 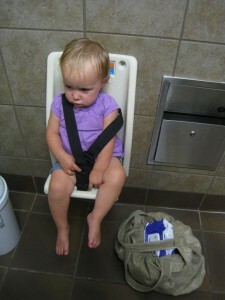 So, after Maelie had her diaper changed, she got to try this out. Then…at the same travel plaza, no less, THIS! 64 oz. of create-your-own caffeinated glory. Vanilla Coke Zero was our choice today. Then, the Cutie totally fell asleep. 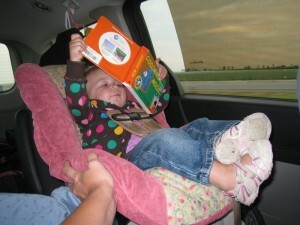 She has been quite anti-nap this entire trip.) But I couldn’t resist taking this picture, and I know you won’t be able to resist ooohing and aaahing over the adorableness oozing all over the place. We stopped at Fazoli’s for dinner, and Maelie got a free kids’ meal, which we totally did not plan. I love happy surprises like that! 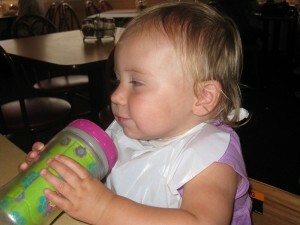 In the first picture, she looks so stinkin’ cute in her I-am-SOOOO-ready-for-this-Italian-feast bib…which she ripped off two minutes later. 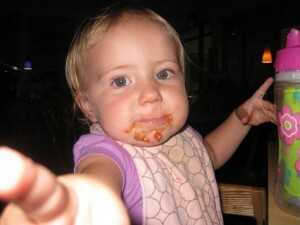 But you can see from this shot that the lasagna was a hit. Then we drove more and found a hotel. Just as a side note, we splurged in St. Louis. This? Was a coupon-special, right-off-the-freeway, cheap find. It’s not half bad for being all that. 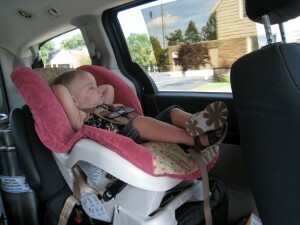 And the best part is, Maelie doesn’t care. She loves, loves, LOVES hotel rooms. Already. And having cuddle times with daddy. I wonder what adventures tomorrow will bring. 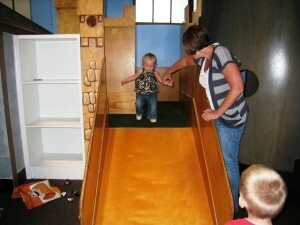 So…I deprived you of precious Children’s Museum pictures yesterday. Sorry about that. The Great Schroeder Adventure starts to wind down tomorrow. We’ll be leaving Mississippi in the early afternoon, and we’re hoping to make it more than halfway before stopping for the night. I should be able to blog, but if I can’t, it’s because the hotel doesn’t have internet. It’s been really great to see friends…to let our worlds collide a bit. It’s always different to see friends from Indonesia in the U.S. but cool to see how the friendships remain…and how they aren’t limited by location. I’ve been so blessed by the people I’ve met through each chapter…each friend adds something different to my life. And I don’ t have any pictures on the computer yet? 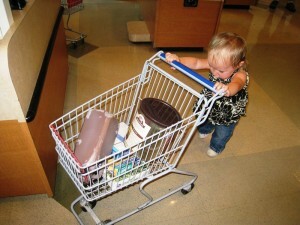 And tonight Maelie got to hang with daddy and the boys while Sarah and I went shopping. It was almost too much excitement to take in. I’ll make up for the lack of pictures tomorrow. Today was really low key… and NO driving. Which we were very happy about. I went for a little run with Sarah and drank some coffee, which is pretty much a perfect start to any morning. Then we hopped over to the NICS Home Office to say hi to a few people from our Indonesia life. It was good to see them and a little emotional. But not too much and I left feeling thankful…for an unforgettable chapter of life and for where we are now. 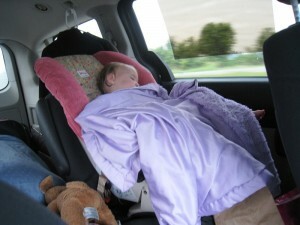 Then we headed back to the house where Mae loudly protested her nap for over an hour before finally giving in to sleep. 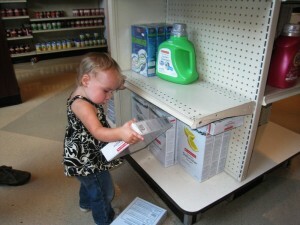 But I couldn’t be too annoyed by her after I saw this picture of her and her new favorite activity. 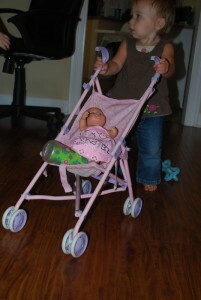 No doll required…pushing the stroller is enough happy for her. 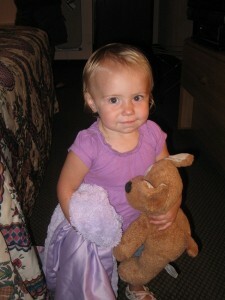 (Though I guess Tobin chose the picture WITH the doll. ;)) Really cute. 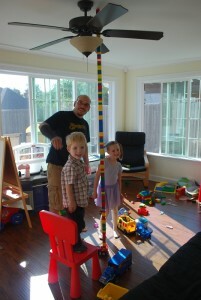 While she slept, Tobin built this with two pretty awesome kiddos. They thought he was the coolest person ever. Then we ended the day with some Settlers of Catan, which the four of us used to play for hours and hours in Indonesia. So…it was a random kind of adventure day. Well, we started off planning to go see this. Which, apparently, is not a good idea if it’s raining. We may hit it on the way back… or maybe not. Still figuring out that one. 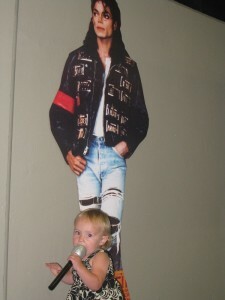 On our drive down to Southaven, we stopped at a “travel plaza” (more on THAT later…) and I found this. And, between the two of us, we actually ate it. It was pickled. And it was not very spicy. But we ate it. 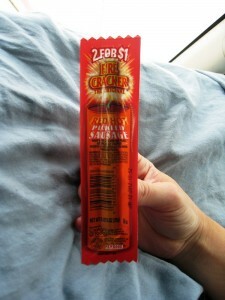 ‘Cause we lived in Indonesia and will eat anything. 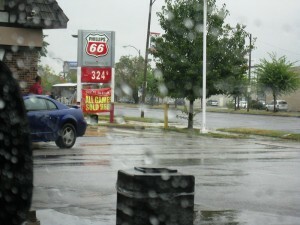 Gas prices are cheap…well, compared to the Chicago area. We like that very much. 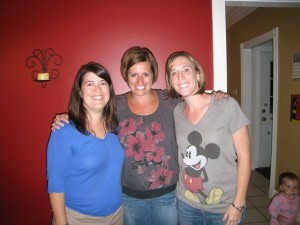 Love reunions and good times. In hindsight, we probably wouldn’t have planned things the way we did…four days in a row of significant driving time does not really make a happy little girl. Or a happy mommy and daddy. 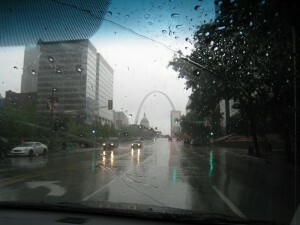 But today we drove to St. Louis, the city that could be considered an icon of my childhood. Of course, it was fun to see the Arch as we crossed the river; we’ll visit that tomorrow. Since we didn’t get into town until around 4 p.m. our highlights are pretty limited. Though we did get a pretty sweet hotel room downtown. I’m not sure I’ve ever stayed downtown anywhere, so this is cool. And the view is sweet(ish). When we went to have dinner, this was outside the restaurant. 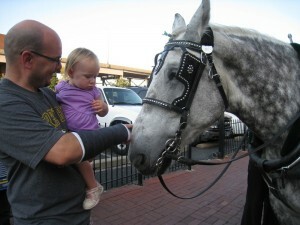 Carriage rides were a little too spendy, but the lady was very nice and let Maelie pet the horse. His name was Romeo, and Mae did not know what to think of this giant animal. T’was cute. 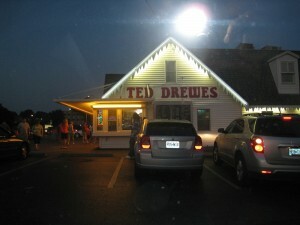 Ted Drewes, which is kinda the reason we came to St. Louis. I joke about that, but really, it’s half true. 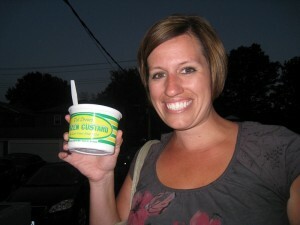 And here is me before I scarfed down (a large part of) my most-amazing Hawaiian sundae. I did a quick calorie count and figured that I can eat it about once every five years and still be ok. Seriously…amazing stuff. And the lady who made our sundaes swore we looked really familiar. Happy Trails! I’ll be writin’ y’all from Mississippi tomorrow! And Maelie napped a little. A little. And we had Culver’s for lunch, which was just ok.
And then we HAD to stop here before we drove the last stretch. 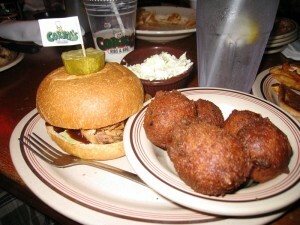 This was MUCH better than Culver’s. 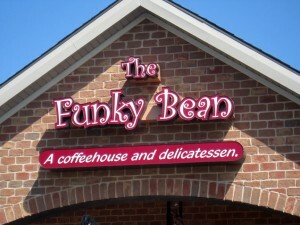 Seriously, if I ever own a coffee shop, the words funky and/or bean will be part of the name. 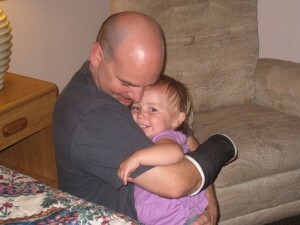 And, because I can, even though she refused to nap and screamed often…this? Sometimes I wonder if she has any idea how stinkin’ cute she is. So, yeah…we’ re officially on vacation. We ended up leaving home earlier today than we had planned so we went to Bay Beach. 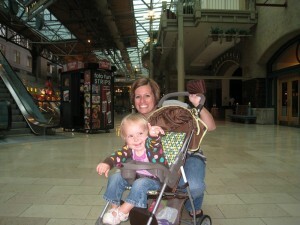 Maelie had fun with her second cousin, Graham, and she also went on her first carousel ride and train ride. So cute…and pics will be coming from that later. Tobin and I also got to go on the Zippin’ Pippin, the new wooden roller coaster. A fifteen-minute date with my hubby…and I screamed like crazy…and gripped the bar so tight that I drew blood. Seriously, it had been almost a decade since I’d been on a roller coaster. I can’t say I loved it, but I didn’t die. 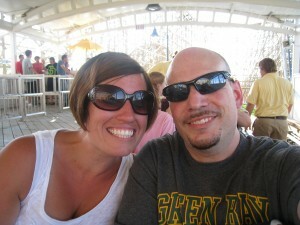 Here’s a pic of us just before the infamous, blood-drawing, coaster ride.